Includes the C925 Connectivity Installation Kit and an internal print server to connect a printer to most major networks using Ethernet with RJ-45 connector. Supports the TCP/IP (IPv4 and IPV6) application services and is compatible with popular operating systems including Novell NetWare, Microsoft Windows as well as UNIX, Linux and Apple Mac OS. The firmware resides in flash memory which allows upgrades via software download. Firmware upgrades are flashable and can simultaneously address multiple devices. The embedded web page allows administrators to flash update printer firmware or access printer settings using a web browser to easily monitor printer status and change default settings. An internal print server to connect a printer to most major networks using Ethernet with a RJ-45 connector. 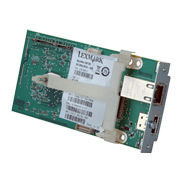 Supports Gigabit Ethernet networks as well as 10BaseT and 100BaseT (Fast Ethernet) networks. SNMPv3, IPSec and 802.1x authentication provide security measures for communications and data encryption in supported printers and MFPs. SNMPv3 supports encrypted and authenticated management traffic protecting remote configuration and device status messages. IPSec can be used with both TCP/IP IPv4 and IPv6 networks and provides encryption and authentication of communications at the network layer. Management is simplified by network settings that can be established either automatically or remotely - configure using MarkVision, command line or the GUI utilities.